Looking for mirror design ideas to make your home look not just bigger and brighter, but more stylish, too? From standout gallery walls created with prettily framed mirrors to minimalist-inspired mirror design ideas, our stylish spaces will provide plenty of inspiration for displaying mirrors, whether contemporary buys, antique finds or vintage pieces. Find tons more design inspiration on our dedicated hub page. Mirrors make the perfect addition to an on-trend gallery wall and can help give the appearance of a larger and lighter space – especially helpful if you're using a dark paint shade as the basis for your gallery wall. This vintage-style room proves that aesthetic appeal and practicality can join hands to form a stylish yet functional gallery wall inspired space. Like this as an idea? Browse our top tips for guidance on how to hang a gallery wall. A dark hallway is always a good spot for a mirror. If you're a lover of vintage or period style, look for one with an ornate frame that will create a real impact on the decor of the hall. Here, a gold-framed mirror is matched with reflective wallpaper to add a brightening effect. For more tips on how to lighten a dark hallway, take a look at our feature. We've got lots more lovely design ideas for hallways, too. A gallery wall devoted entirely to mirrors doesn't just brighten and enlarge a space visually; it also creates a visually striking focal point, and is effective at opening up a space. This bedroom design is the perfect example of one of our favourite mirror design ideas. 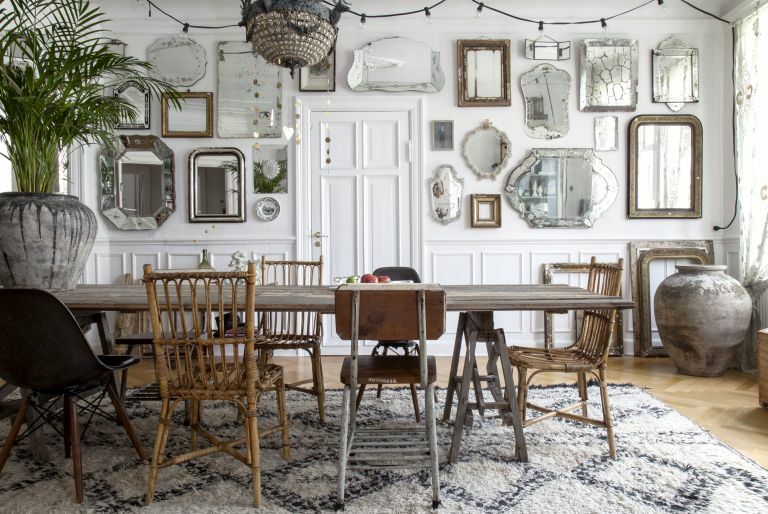 We like this mirror display idea if you have a collection of slightly mismatching, antique mirrors. The key to success? Don't position your mirrors too uniformly or too far apart, and avoid perfect symmetry – laying them out on the floor first can be the best way to get a feel of what works best where. Find more gallery wall inspiration in our design feature – we've covered everything from plates to plants to prints. If you're blessed with high, sloping ceilings, you might also consider taking advantage of them with the addition of a mirrored gallery wall which will enable you to make the most of an awkward space. Here, the mirrors brighten a dark spot in a hallway and add bags of interest to what's usually an under-used space. Hanging mirrors horizontally on the narrowest wall of a room – at around head height – is ideal if you're trying to achieve the effect of a wider space. This design trick works particularly well if mirrors aren't perfectly aligned with furniture – an effect which also adds interest to a space. Opt for a mirror with a slightly softer, rounded edge if you're designing a room with a Mid-century or vintage inspired feel. We love this Dutchbone Bradley Wall Mirror from Cuckooland paired with a gorgeous, floral wall mural. Mirrors with softly rounded edges make the perfect addition to a Mid-century inspired space and are particularly desirable when designed as part of a picture-led gallery wall. We love the brightening effect of pairing a mirror with this teal green wallpaper from Farrow & Ball. If you're looking for more green living room design ideas, be sure to take a peek at our gallery. We've got plenty of Mid-century modern decor ideas, too. If you're working with a warm-toned metal mirror, for example something that's copper or gold, consider pairing it with similarly sunny yellow and orange shades. In addition to making a space more welcoming, research suggests this combination of warm, sunny tones has the ability to enhance the mood of a room. Find this Sunburst Mirror at Furniture Village. If you're looking for a mirror design idea that will create a unique feature, but don't want to sacrifice your distinctly minimalist style, consider going frameless. In a bathroom with a more traditional or luxury feel, antiqued glass is perfect for adding character. Browse more lust-worthy luxury bathroom design ideas. Opting for vintage frames effectively complements the laid-back feel of minimalist or Scandi-inspired schemes, adding subtle interest to a space and further enhancing the light and bright feel synonymous with this interior style. If (like us) you can't get enough of Nordic inspired spaces, you'll want to browse our cosy Scandi room design ideas. If your priority is to design a space that feels larger and lighter than it really is, you need a large, round mirror in your life. Position it so that it can been seen on entry to a space effectively draws the eye and creates the feel of a larger and lighter space. Opt for a model with a slim frame if you're a fan of understated, minimalist interiors and position above a similarly elegant console table for a hallway that feels spacious and welcoming to guests. Positioning a statement mirror (or collection of mirrors) above a fireplace draws the eye, creating a focal point within a space and is one of our favourite mirror design ideas. The taller the mirror – or collection of mirrors – the greater the impression of a high ceiling in the room. Styling a grey stone fireplace with antiqued silver mirrors and other glass accessories creates a strikingly subtle finish. The odd well-placed, house plant is a welcome addition to an otherwise cool toned, silvery-grey scheme. Plants are perfect for adding life and colour to a cool scheme, for more house plant display ideas, browse our design guide. If your interiors taste is more traditional, opt for an understated mirror as part of your scheme. Pairing a white frame with a white scheme is a particularly subtle approach that will effectively open up a small space. Pair with an unfitted, freestanding unit and open shelving to create the perfect, welcoming boot room. Explore more of our fabulous ideas for boot rooms. And, if you're looking to create a new scheme for an entrance to a period home, check out our traditional hallway design ideas. Find a similar mirror at Marks & Spencer, for similar console table try The Cotswold Co.
Stylishly complementing a boho inspired space, we love the idea of sourcing antique mirror-doors, which can be propped in a corner to enlarge a space. Alternatively, if you fancy a DIY project, revamp an existing piece of furniture with the help of our guide to up-cycling furniture. We love this Wooded Manor Mirror from Anthropologie, which looks perfect paired with a combination of modern and more traditional pieces. If (like us) you're a big lover of the dark and atmospheric interiors trend, but are concerned about it making a room feel too small, you might consider offering relief from your use of inky shades with the help of a large, floor-standing mirror. Pairing a white mirror with a dark scheme offers a stylish contrast. We love the French feel of this Floor Mirror from Dormy House. In addition to making a space feel larger, incorporating a mirrored wall into a bathroom is an effective – and waterproof – alternative to tiles. We love this combination of large distressed mirror panels with bold patterned tiles. This (almost) matching Tamar Cast Iron Skirted Bath Tub from Drummonds perfectly finishes off the look. For more stunning patterned floor tile inspiration, browse our design guide. We've got traditional freestanding bath designs, too, if that's what you're after. Similarly, for a stylish addition to a modern kitchen, we love the idea of opting for a mirrored splash back – especially if it's in an on-trend copper or brass finish. For more kitchen splashback ideas, browse our design guide. Using a large, frameless mirror as a base, we love the idea of creating a display using a collection of small, ornate mirrors, as well as prints and other ornaments. This technique creates a stunningly intricate focal point, which is enhanced by the reflection from the large mirror. Using ceramic plates to create a stylish gallery wall has been a popular trend over the past couple of years. With this trend mind, we like the idea of channeling the look with a display of patterned ceramic mirrors. Find these Blue Floral, Orange Floral and Green Spot ceramic mirrors from Oliver Bonas. Looking for more design ideas and inspiration?